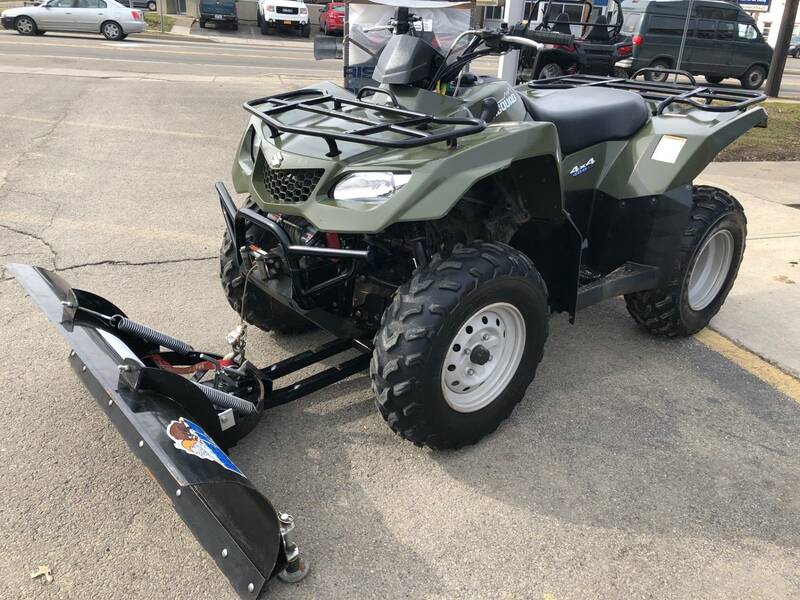 KingQuad® 400AS W/ Plow and WInch! There's no limit to how tough and versatile a middleweight ATV can be. 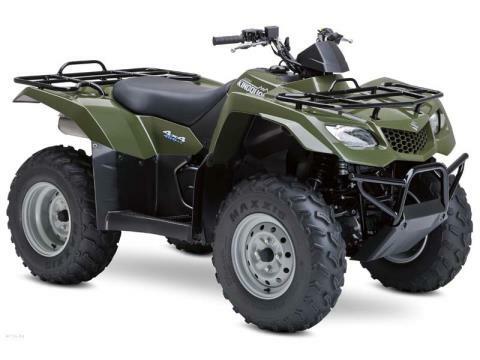 For proof, check out the KingQuad 400 4x4 Automatic. 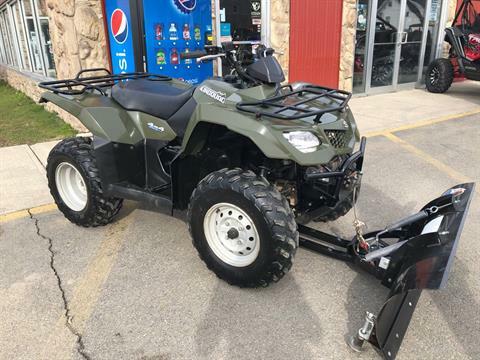 The KingQuad 400 lets you quickly and conveniently select two- or four-wheel drive operation. 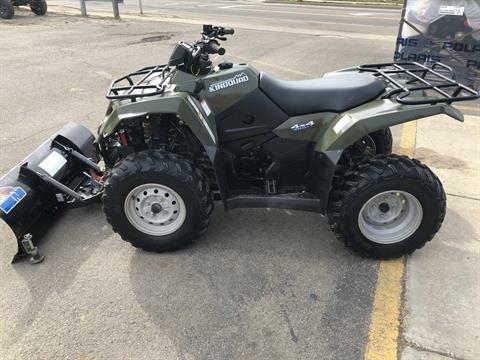 And whether you have a long day of work ahead or a long trail in front of you, you'll appreciate your KingQuad's load of technically advanced features. Styled for a big, strong appearance with high radius fenders, a rugged-style grill and large front bumper designed for easy winch installation. Compact instrument display including speedometer, odometer, tripmeter, and indicator lights for neutral, reverse and oil temperature. 12V/120 watt electrical outlet mounted in left front fender - standard automotive-style outlet fits a wide range of electrical accessories. Twin 35/35 watt fender-mounted multi-reflector headlights, plus large 5/21 watt combination taillight and brake light as standard equipment. Durable steel frame made of large diameter, thin-wall tubing for maximum strength and minimal weight. Lightweight polyethylene skid plate and bumper guard provide maximum protection with minimal resistance over rocks and other obstacles. Independent double A-arm front suspension with class-leading 6.7 inches of wheel travel for a comfortable ride on all types of terrain. Swingarm-style rear suspension with oil-damped shock absorbers provide 6.7 inches of wheel travel and 9.3 inches of ground clearance. High-capacity racks and towing capacity, plus 4 liter storage box now located and protected under the seat. Dependable 376 cubic-centimeter, single-cylinder, 4-valve, 4-stroke engine is tuned for high-torque output and quick acceleration, and uses Suzuki's well-proven SACS air-oil cooling system. Gear-driven balancer shaft reduces vibration. Keihin™ CVK32 carburetor provides smooth throttle response and high fuel efficiency - throttle pulley system designed for light throttle lever operation. 5-speed transmission with automatic clutch, high / low range and reverse - sub-transmission and reverse controlled by a single automotive-style, fuel tank-mounted drive selection lever. Choose 2WD or 4WD operation with convenient handlebar-mounted control lever. Torque-sensing limited-slip front differential provides maximum traction and light steering in tight turns. Electric and recoil starting with "in gear" starting capability - engine will start in any transmission setting by pulling the hand brake lever and pressing the starter button. Angular and aggressive bodywork featuring high clearance fenders, the distinctive KingQuad headlights and grill, a T-shaped seat, and highlighted by a large diameter steel tube bumper. Large 4.2 gallon fuel tank for long riding range and improved rider comfort. Large 190 millimeter diameter front disc brakes combined with front brake calipers featuring 34 millimeter diameter pistons for improved braking performance. 25 inch Maxxis tires featuring an aggressive dual stage tread pattern for consistent traction and a quiet ride are mounted on durable steel wheels. Automatic version of the KingQuad 400 combines comfort and practical features with a sporty feel and an aggressive look - the best features and value in the mid-size class. Gate-type shift lever is mounted on the left side providing simple and precise shifting in various riding conditions.